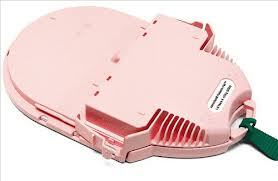 HeartSine has taken an innovative approach to maintenance items by incorporating the battery and electrodes into one single-use cartridge called the Pad-Pak. The advantage to the Pad-Pak is that there is only one date to monitor and only one item to replace on expiration or after use. Includes one set of pediatric pads and battery. ; For use on children 8 years and under or 55 pounds or less. © 2019 Less Stress Instructional Services. All rights reserved worldwide.